Since its introduction to the United States in 1916, the Japanese beetle has spread to more than 30 states and its population has been growing phenomenally over the past decade. While the beetles are not dangerous to humans, they are a devastating threat to lawns, ornamental plants, and food crops. Management of these destructive insects costs the US $450,000,000 annually. 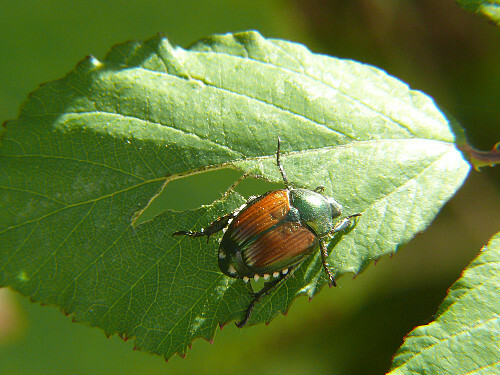 Japanese beetles destroy vegetation at two stages of their lives. Immature beetles (called “grubs”) destroy lawns by eating grass roots and thatch, as well as the roots of bean, corn, strawberry, and tomato plants. These youngsters are difficult to get rid of because they live underground until maturity. Adult Japanese beetles continue the destruction above ground, skeletonizing foliage. They’re not picky – besides leaves, these insects happily eat flowers and fruit, and will go after any one of over 300 plant species! Eggs are usually oval when newly laid but become more spherical as they mature. They’re creamy-white to translucent and 1.8 mm in diameter. Grubs are curled into the shape of a “C.” They have a V-shaped pattern of hairs on their hind ends, visible under a magnifying glass. Adults are 3/8” (10mm) long and shiny, with a green head and tan-brown wings. Their outstanding characteristic is tufts of white hair – 2 at rear and 5 along each side. Biological control: Deal with a more serious Japanese beetle problem by fighting these insects with … other insects! Ants, ground beetles, nematode worms, and some types of wasps can be useful in controlling Japanese beetles.